The Bognor Tuesday Double In Double Out League divisional pairs knockouts took place at the Newtown Social Club and 31 pairs turned up. 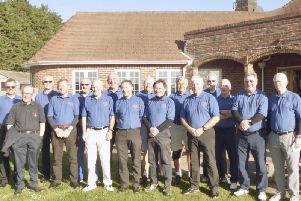 In division one, 12 pairs were involved and the first semi-final saw Wayne Wadsworth and Cliff Prior (QE2) beat Adam Hall and Jack Sheridan (Friary Arms). The second semi saw Jack Danahar and Richard Ragless (QE2) get the better of Jim Robinson and Ashley Clements (The Hoff). The final saw Prior win the bullseye to get the first throw, and a 180 followed from Prior. But a 140 from Ragless, sandwiched by 99 and 97 from Danahar gave them a chance, and Ragless eventually hit the double for the first leg. Scores of 140 from Prior and Danahar saw a close second leg. Wadsworth missed double eight for the leg, as did Prior, allowing Danahar to leave double top for Ragless, which he hit. The third leg saw poor scoring from Prior and Wadsworth, while a 140 from Ragless was equalled by Danahar with a ton and 139 to leave 32. Ragless needed one dart to hit double 16 for the win and the pairs title. Division two’s contest had 19 pairs and in the first semi-final Andy Stubbs and Mark Sheppard (Hunston Club) lost to Trish Kidd and Andy Cooper (Cabin Cruisers). The second semi-final saw Andy Chant and Rob Rice (Chi Snooker Club) beat Gary English and Rob Palmer (Cabin Cruisers). The final saw Cooper go first and get his in-shot. Chant followed getting his own in-shot, but Kidd followed with a 140. Consistent scores from Kidd and Cooper put them on their finish but Rice to set up victory in the first leg. The second leg saw Kidd and Cooper get the better scores, and Cooper finished it with his double. In the third leg, Kidd hit a ton, Rice 101, but Cooper hit double ten for the leg. Leg four saw 95 from Chant and 81 from Cooper, while 125 from Kidd eventually left them with 170. Cooper hit the two treble 20s needed, but the bullseye didn’t go in. Kidd missed the double after hitting single 18, but their opponents were too far behind and Cooper took one dart to hit double 16, taking the division-two title.